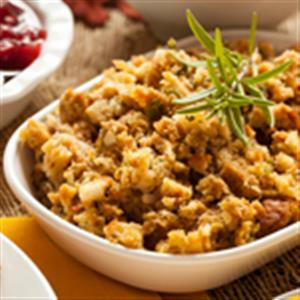 Description: KetoVie Café Savory Stuffing is made with crumbled Wholesome Bread seasoned with herbs and spices. It has a 3:1 ketogenic ratio with only 2.2g net carbs (total carbs minus total fiber). Use KetoVie Café Savory Stuffing as a side dish or a base for a delicious meal. Each tray contains three delicious servings. KetoVie is designed for individuals over one year of age and indicated for the dietary management of intractable epilepsy and other conditions managed by a ketogenic diet. Preparation: Microwave: Peel film seal back partially to allow for proper venting. Microwave on high 2 to 3 minutes, stir and cook for an additional 2 minutes (oven times may vary). Carefully open cover and serve. Stovetop: Empty contents of tray into sauce pan and gently stir until heated through. Ingredients: Bread (eggs, macadamia nut meal, butter [cream, salt], water, flaxseed, almond meal, coconut flour, leavening [sodium bicarbonate, corn starch, sodium aluminum sulfate, calcium sulfate, monocalcium phosphate], psyllium fiber, sweetener [erythritol, rebiana, natural flavors], guar gum, xanthan gum, fumaric acid and sorbic acid [preservatives] [contains one or more of the following hydrogenated oils: soybean oil, palm oil, cottonseed oil and mono and diglycerides], calcium propionate [preservative]), water, onion, butter (cream, salt), celery, chicken broth (salt, dextrose, monosodium glutamate, yeast extract, canola oil, dehydrated parsley, maltodextrin, extracts of turmeric and paprika, natural flavors, [including extractives of celery stalk, leaf and seed], sugar, soy sauce [soybeans, wheat, salt]), parsley, poultry seasoning (thyme, sage, marjoram, rosemary, black pepper, nutmeg). Contains eggs, milk, nuts, wheat and soy.